Tanks remain one of the main weapons in modern warfare despite the drastic increase in the use of precise weapons in minor conflicts. At the end of 2017 Russia’s Defence Ministry ordered several new era T-14 Armata tanks. Yet it’s unclear how many the country’s Uralvagonzavod machine manufacturer will deliver. According to the company, the price of each new tank (250 million rubles, $4.4 million) can be minimized. The basic version of the T-14 tank uses a 125 mm gun. However, according to the weapons manufacturer, this combat vehicle can also be fitted with a 152 mm cannon. The T-14 tank is capable of shooting up to ten rounds per minute and can hit targets at a distance of seven km. 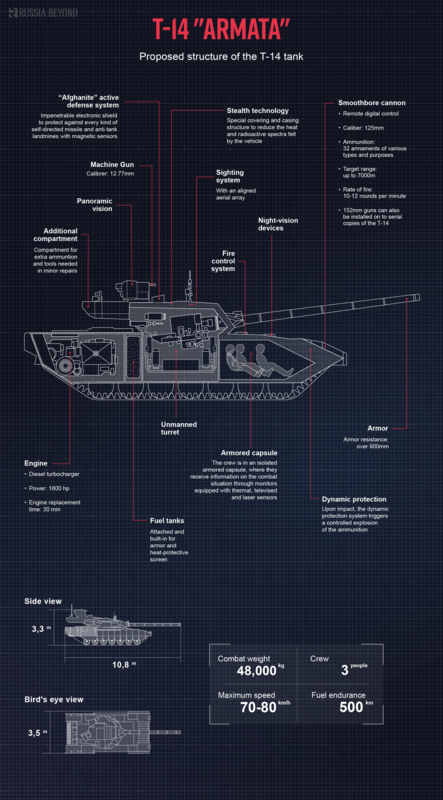 In comparison, the American Abrams tank can only fire three rounds per minute, and has a range of just 4.6 km. In addition, each new Russian tank is equipped with its own radar system, which gives it specific advantages in terms of aiming and firing control. As a result the T-14 can also hit aircraft and intercept enemy rockets and missiles.